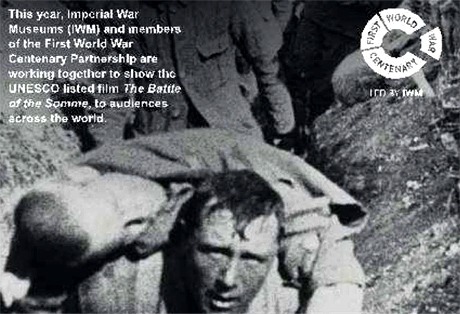 DONEGAL County Museum has issued a public invitation to a special free screening of the 1916 film ‘The Battle of the Somme’ at Fort Dunree Military Museum, Buncrana, this Saturday. The museum has organised the centenary event in partnership with Imperial War Museums (IWM) and Fort Dunree. The black & white film is the world's first feature-length war documentary, inscribed onto the UNESCO’s Memory of the World Register. It is accompanied by a music score composed by Laura Rossi. The Battle of the Somme began on July 1, 1916 and was intended to achieve a decisive victory for the British and French. ‘The Battle of the Somme’ will be screened on September 3, 2016 at 2pm in Fort Dunree Military Museum. The Somme quickly became a bloody stalemate on battlegrounds that "turned into a muddy quagmire after torrential rains in October of that year", said a spokesperson. It claimed over 80 Donegal men on the first day alone and there were more than a million casualties on both sides by the time it ended after 141 days on November 18 ,1916. "In the year of its release around 20 million people saw the film, many hoping to see an image of family or friends." Admission is free and running time is 74 minutes. Please note it is suitable for children aged 11 and over who must be accompanied by an adult. For more information please contact Fort Dunree on 074 9361817 or email dunree@eircom.net . More details in our Inishowen Events Guide .